Need a hand from the Moovly team? Check out the new and improved Moovly Help Center! Everyone needs a hand sometimes. Although Moovly has been designed to be a user friendly and intuitive platform, there will still be times when you have questions and need help. That’s why we’re here for you when you need us! There are a couple of ways you can contact us for help directly. You can contact us via our website or directly from the Moovly platform (using the turquoise button in the bottom right corner of each page when you are logged in to your Moovly account). Want to use FaceBook to get in touch? You can reach out via our FaceBook page, and you can also ask other Moovly users for tips and tricks via our Moovly Friends FaceBook group. To continue providing you with the best user support and user experience possible, we’ve now added a Moovly Help Center to Moovly. Help is available all the time and it’s so easy to find answers! There are two collections in this Moovly Help Center: one on Moovly Classic (the original editor), and another on Moovly Studio, the new editor that was launched in April 2017. New Moovly users after April 1st 2017 only have access to Moovly Studio. Remember to select the correct collection! The Moovly Help Center provides you with answers to the most commonly asked questions from other Moovly users, and articles on how to use the features of the Moovly editor. This means that you don’t need to wait for a reply from our support team, but you can browse or search our knowledge base for quick answers to your questions. The Moovly Help Center collections are divided into different sections, such as ‘Working with the editor’ and ‘Billing’. You can either browse the different sections in the two Moovly Help Center collections, or you can search for certain topics and keywords using the search bar at the top of the page. Didn’t find what you wanted, or do you think we can improve the articles? Let us know using the turquoise button in the bottom right corner of the Moovly Help Center page. You can also let us know if an article was or wasn’t helpful using the emoticons at the bottom of the article. We then use this feedback to improve the articles, so your feedback helps other Moovly users! The Moovly Studio Help Center is constantly updated based on user questions. Simply select one of the emojis at the end of an article, and we receive this feedback immediately. We then use this to improve answers for other Moovly users. 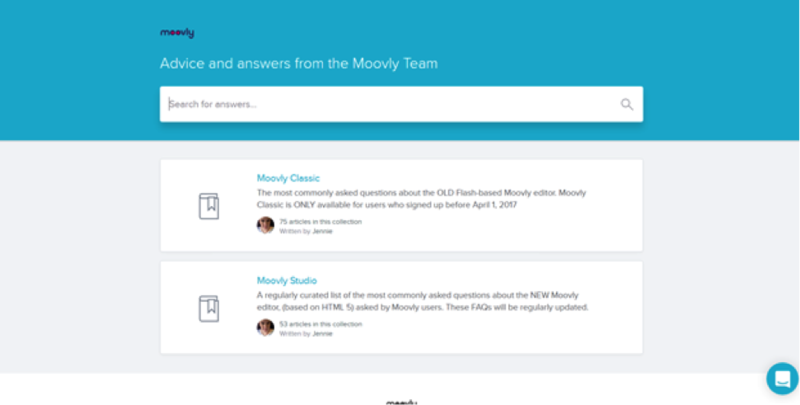 The Moovly Help Center is also updated based on user questions, and the answers also evolve to reflect new or modified features in the Moovly Studio editor. When you are in the Moovly Help Center, you know that you will always have the most up to date information. Do you need help in the editor? You can also access the Moovly Help Center when you are in the editor – just click ‘Help’ in the top right corner, then “Help Center’. Why not also take the tour of the Studio editor for a brief overview of how it works? There you have it! Our new and improved Help Center. If we are not available to answer your question directly, you know that you always have access to the Moovly Help Center. Next time you have a deadline at work or school and you’re awake at 4am going crazy, you know you can always rely on the Moovly Help Center to give you a hand! What are you waiting for? Get started on your animated video today. Not only will your teacher be impressed with your animated video, but your classmates will all be jumping for you to reveal your video secrets!